I don't think you can fight with a metal rod in your leg. I'm liking the U2.5 2.35 line on Gastellum vs Woodley they're both pretty dangerous. I could see them wrestling for this fight, but its 2.35 odds. I also havent seen much Watson, but think Natal is pretty awful. 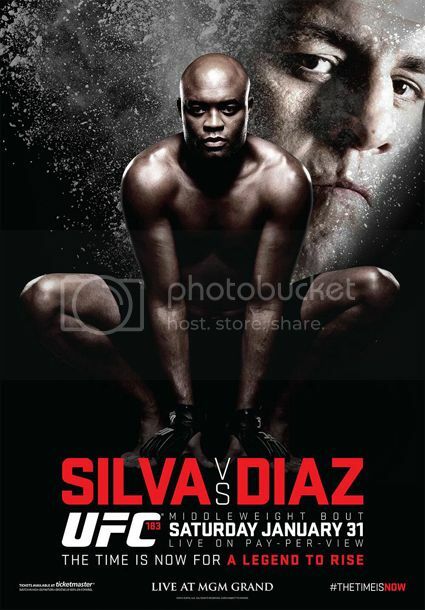 I love Nick ,he is an all time great and if he can avoid the legkicks(which he can not avoid ) he will knock Silva out. Silva likes to put his hands down and move his head which is the very worst thing you can do against Nick.If you do this he will throw like 100 punches in a row and will punish you. The only way i see Anderson win the fight is at distance,throwing legkicks and circling alot like Condit. Nick had the sickest cardio and now without cutting weight i expect him to run around for 25 minutes without stopping and throwing huge ammount of punches. Also his chin is so sick i can not see Silva knock him out ever. The current line is crazy thogh.I think the real line is at 50-50. I like Gastelum and want him to win but i am not so sure.He is very agressive and can eat a counter right from Woodley.It should be an interesting fight. It is pretty good card actually - at least 5-6 very good match ups. what are you guys smoking? Im not even going to comment on gryzzlys posts (LOL). Diaz is the dream match up for Silva, a high volume striker who is very easy to hit and wont go for takedowns and can be bullied with legkicks, If Silva has confident leg kicks after his injury Diaz probably should win less than 10% of the time, and even without leg kicks what is Nick going to do, is he going to try to swarm light punches against the best counter-striker in the history of MMA? Literally If I had to hand-pick the best match up for Silva it would be Diaz, so unless Silva has some severe issues with his comeback Nick is drawing dead here. I think the only way Silva wins is with a lot of leg kicks and circling.If he fucks up Nick's front leg in other words. Do you think Silva can knock Diaz out with a counter punch (i don't). Also i think many people forget that not only Weidman knocked out Silva with not so vicioos left hook,but he knocked him down in the second fight with a short right from the clinch. I do not thrust Anderson's chin anymore.Maybe this ship has sailed. Also i think Anderson is(was) very good with the counter punches against guys who commit to their punches and Nick is not that guy. So in general the only way i see Anderson wins is ,if he avoids the fight and win a decision.And i think he will not do that . Nick's boxing is very good. He has trained with great stand up fighters like Andre Ward, Joe Shilling and Artem Levin to name a few. They are all better stand up fighters than Silva and all had good things to say about Diaz stand up. I am definately no counting him out in this match up against and old Silva coming after this brutal injury. However the size advantage for Silva is huge here. He is way bigger and stronger. I am not sure Diaz will be able to take clean shots from him no matter how good his chin is. I fear Anderson is just going to tie him up and destroy him in the clinch. Will be rooting for Diaz though. I hope it is a great fight. Is it just me or why do mma fighters still train with boxing coaches till this day? You'd think it would be better to just train exclusively with kickboxing/muay thai/ karate coaches etc. since it would be more practical and useful in an mma setting, and to prevent yourself from getting tunnel vision during a fight. I'm just a casual fan that doesn't know much about fighting but I feel like some fighters are just too lazy to learn how to throw kicks and more dynamic strike. I don't think people quite realize how insane it is for Diaz to do this. He's not even a big 170er and is going up to fight one of the best in the world at 185 (and a massive 185er at that). This is the same Diaz who fought Gomi (160lbs) and Noons at LW against the guy who didn't look undersized at all when he went up to 205. Huge respect for Diaz, but I'm betting Silva at -370 for $370. With some different career choices (see Rashad/Shogun/Machida) we could have been talking about a 155er vs a 205er. How absurd is that. LIKE WTF. ..and you're picking him to win. I don't think people quite realize how insane it is for Diaz to do this. He's not even a big 170er and is going up to fight one of the best in the world at 185 (and a massive 185er at that). This is the same Diaz who fought Gomi and Noons at LW against the guy who didn't look undersized at all when he went up to 205. Huge respect for Diaz, but I'm betting Silva at -370 for $370. Yep, if it goes past 2 rounds, I think Diaz will have an advantage. I already know Anderson's the GOAT, and he'll be slightly taller than Diaz with much more natural body mass, but I won't ignore how he looked in his last two fights, how he took damage to the face in both fights (especially the 2nd fight), his age, time off, and first fight back from a sick injury that would end most fighters careers. If he manages to do it more power to him, will be an amazing feat. Depends how Diaz wins, though. The only way people won't discredit Diaz is if he wins a 5-round war where his face is super bloody and cut up. Lawler vs. Diaz #2 would be nice.